Cafe management software - storage items administration form. On this form you can create/modify/delete storage items. � Default amount in storage for new item is zero. You can add new amount from form below. � From this moment you can use this storage item when you creating menu items. � To change storage item data, just click on storage item in list, change data, and then press Save button. Cafe management software - storage items number administration form. 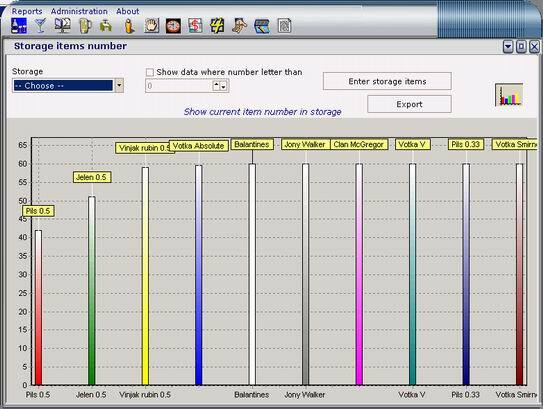 � On this screen you can view number of each storage item, or storage items with number lesser than "number you enter"
� You can see this data as graph to, by clicking on graph button. 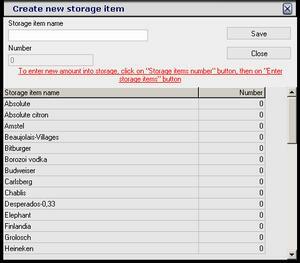 � From this screen you can enter new amount for storage items.